Press B to Jump. Press and Hold to jump higher. Collect gems and other power ups to help you on your way. Press A to use your swords. Try to avoid contact with enemies. Press B while in mid air to perform a double jump. Go to the right to exit the level. 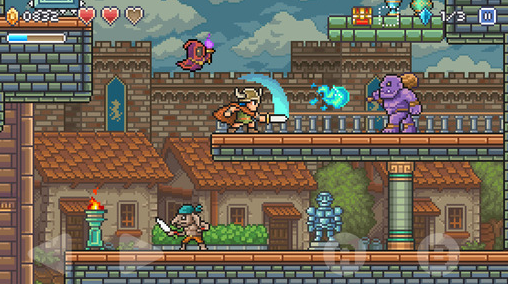 Collect magic orbs to activate your weapon's special attack. Some monsters can be defeated more easily, if you sneak behind them. Fortunately you can do it manually! To do it manually, just use search function in your hex editor app, enter your current Coins value in Goblin Sword and search for it (choose DWORD) . If you see a large list of results, you need to change the value of current Coins value in Goblin Sword by either consuming them or adding them. Go back to the list and find your new current Coins value in Goblin Sword to the large list and finally you can edit the value.